Things look pretty fantastic in August, the final month in the current Fantasy Comic League season. 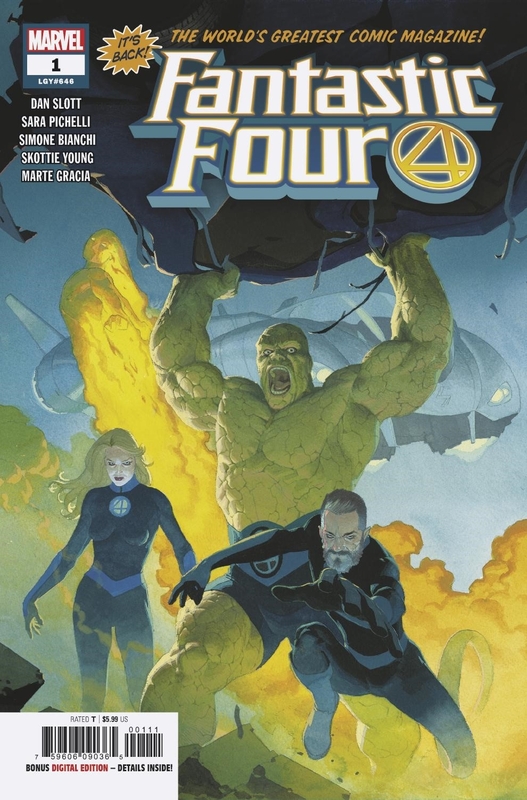 Fresh from launching Tony Stark: Iron Man, Dan Slott plots out the much-anticipated return of Marvel’s First Family, the Fantastic Four, in a new ongoing series. Though fans may be elated to see Mr. Incredible and the Invisible Woman back in action, Human Torch and the Thing remain the better options with their Marvel 2-in-One giving them an extra appearance estimate. Fan favorite writer Kelly Thompson kicks off another promising series under the popular West Coast Avengers banner. Though much like the Fantastic Four, this team, led by both Hawkeyes, does not look to make much of a mark on the League. Ms. America looks to be the only member to have more than one appearance outside of the title. The Hunt for Wolverine comes to a conclusion when the four tie-in minis end and gives way to Dead Ends. After recently shedding herself of the Wolverine title, X-23 stands to have a decent month with three estimated appearances in X-23, X-Men: Red and Adamantium Agenda. Other events of note include the continued Death of the Inhumans and the supposed Extermination of the young, time-displaced X-Men. The Original Five stand to have a good showing with two issues of the event coupled with two issues of X-Men: Blue in the five-week month. The new Infinity Watch team features in two issues of Infinity Wars with Avengers Doctor Strange and Captain Marvel being the stand out picks with four estimated appearances. The Edge of Spider-Geddon begins but will star Spider-Punk and SP//dr, two characters not featured in the tier charts. Several annuals are being released in August, including one each for top tier heroes Daredevil and Deadpool. X-Men: Gold‘s annual focuses on Kitty Pryde’s younger days, but two regular Gold issues push Storm into the upper tier when they explore her connection to the Stormcaster hammer. A reminder that digital exclusives are excluded, so Cloak and Dagger and the new Jessica Jones are not counted. As always, dopplegangers of our main characters are called out for easier identification and to distinguish them from our prime universe heroes. Be wary of the characters found in Amazing Spider-Man: Renew Your Vows, Spidey: School’s Out, Marvel Super Hero Adventures: Inferno, Old Man Hawkeye (with the exception of Old Man Logan if he appears), X-Men: Grand Design – Second Gensis and any Marvel Cinematic Universe-related books as they are not the same heroes as the ones featured in the below tier charts.